The 2014 proxy season is almost over for calendar year companies. Based on our analysis, ISS continues to play an influential role and the energy industry continues to be one of their favorite targets, but it’s getting more difficult to predict how ISS will recommend. Here are a few key observations from this proxy season so far. Once again, ISS is recommending against energy companies at a higher rate than broader industry. 15% of energy companies have received an ISS against recommendation so far (21 out of 139 companies). This is higher than the broader industry rate of 13% against, but slightly lower than last year’s final rate for energy companies of 18% against. E&P companies are a particular favorite of ISS with 20% against (13 out of 66 companies). ISS’s recommendations appear to be unpredictable and inconsistent. Problematic programs at one company appear not to be a problem at others. Companies passing or improving on ISS’s quantitative tests can still be caught with a negative recommendation in ISS’s qualitative analysis. Companies passing the qualitative analysis in one year (implying the programs align pay and performance) fail it in the next year without having changed their programs. If ISS is trying to drive changes, inconsistent approaches will impede that effort. ISS continues to challenge goal rigor. 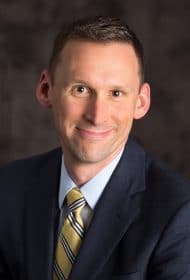 When performance plan outcomes are disconnected from ISS’s view of performance, ISS assumes it is because the goals were not rigorous enough and not because ISS is using metrics that don’t make sense to the energy industry or to a specific company. 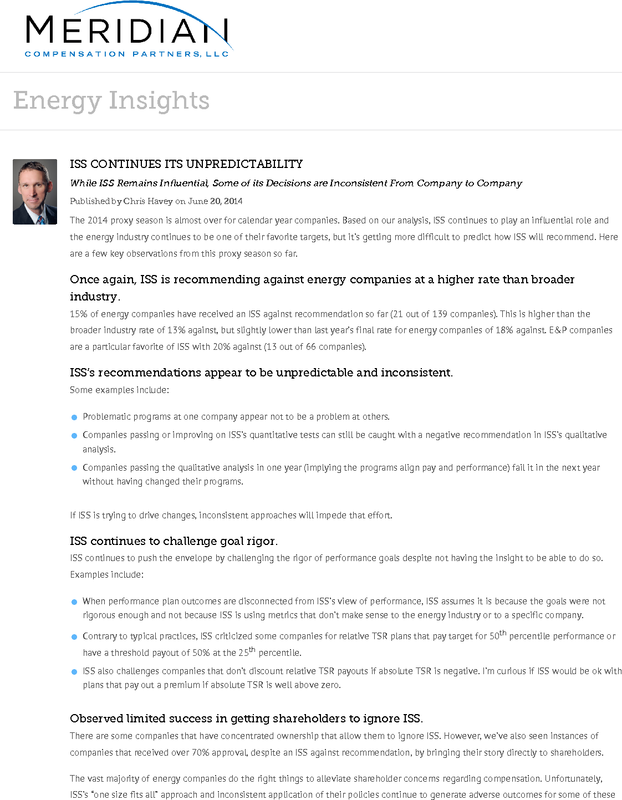 Contrary to typical practices, ISS criticized some companies for relative TSR plans that pay target for 50th percentile performance or have a threshold payout of 50% at the 25th percentile. ISS also challenges companies that don’t discount relative TSR payouts if absolute TSR is negative. I’m curious if ISS would be ok with plans that pay out a premium if absolute TSR is well above zero. Observed limited success in getting shareholders to ignore ISS. There are some companies that have concentrated ownership that allow them to ignore ISS. However, we’ve also seen instances of companies that received over 70% approval, despite an ISS against recommendation, by bringing their story directly to shareholders. The vast majority of energy companies do the right things to alleviate shareholder concerns regarding compensation. Unfortunately, ISS’s “one size fits all” approach and inconsistent application of their policies continue to generate adverse outcomes for some of these same energy companies. Continued engagement with shareholders is one approach to overcome ISS’s influence. Continued education and dialogue with ISS may also lead to some positive changes in their approach. The energy industry might help itself with a collaborative approach and collective dialog with ISS. All statistics based on ISS reports as of June 2, 2014 for the Russell 3000.